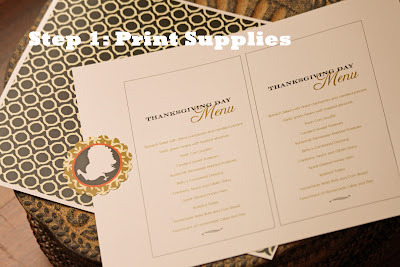 With such a great response to the Amanda's Parties To Go Thanksgiving printables revealed yesterday, I thought it might be fun to post a tutorial on how to make your own personalized Thanksgiving menu. 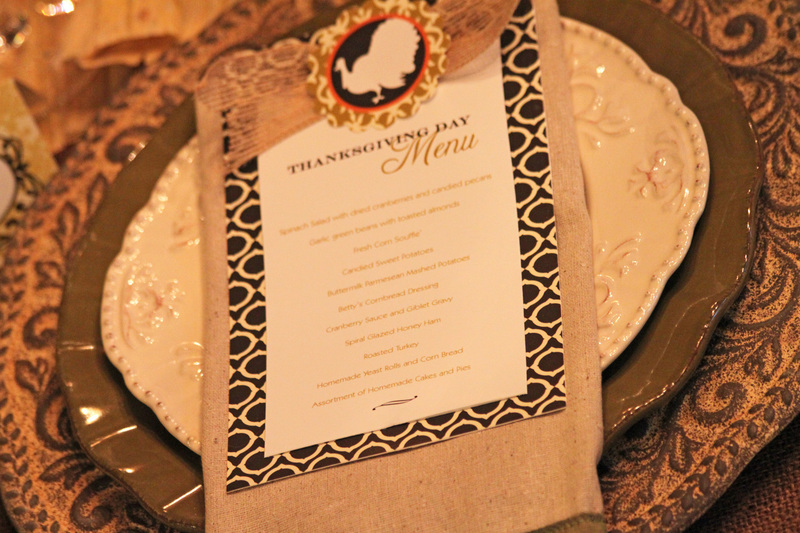 A menu at each place setting adds such a special and beautiful touch to your Thanksgiving table. 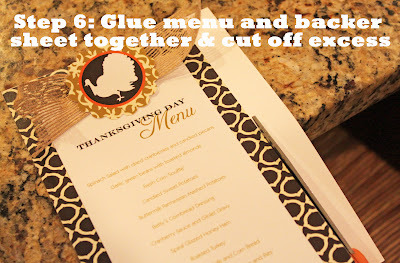 Then using any word processor like Word or Microsoft Works, type up a menu of the items you'll be serving this Thanksgiving. 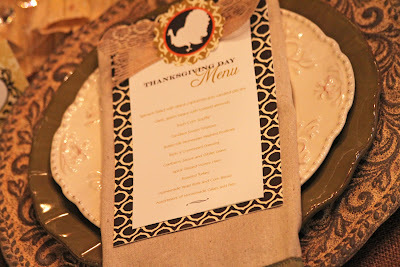 On mine I typed "Thanksgiving Day Menu" at the top but you may want to put "Smith Family Thanksgiving Menu" or "Thanksgiving 2010 Menu" or whatever title you would like. Step 2: Cut out your menu and place it over your background paper. 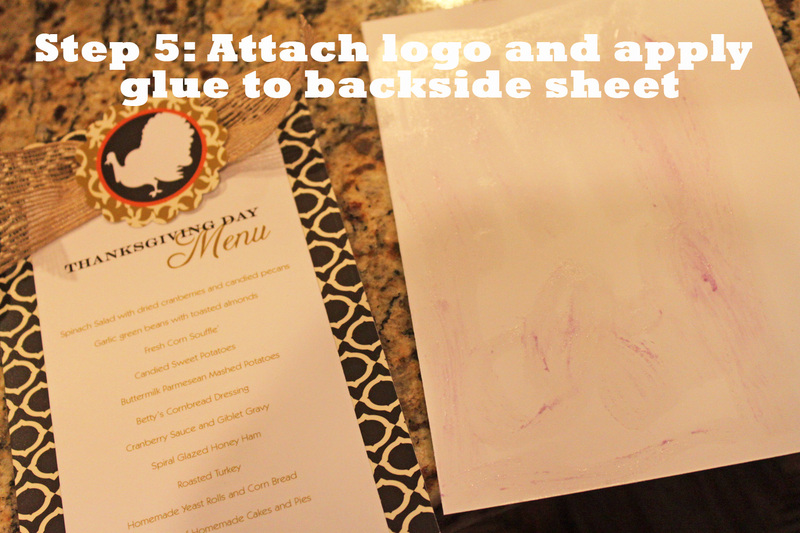 Using a ruler, trace lines onto your background paper approximately 1/2" - 3/4" larger all the way around your menu. You may want to add a little more space at the top like I did for your ribbon, maybe more like 1" larger at the top. Then cut out the background paper on the inside of your line. 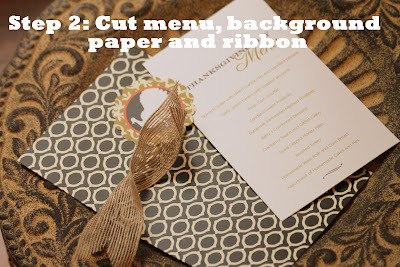 Step 3: Center your menu over your background paper and add a touch of hot glue to the back of your menu and attach it to your background paper. 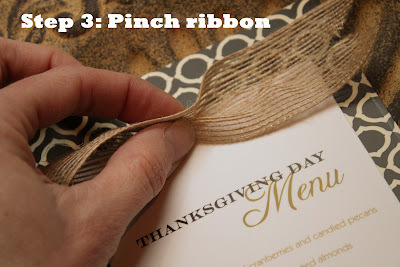 Then cut a length of ribbon approximately 6" long and pinch it in the middle and center it over the top of your menu. 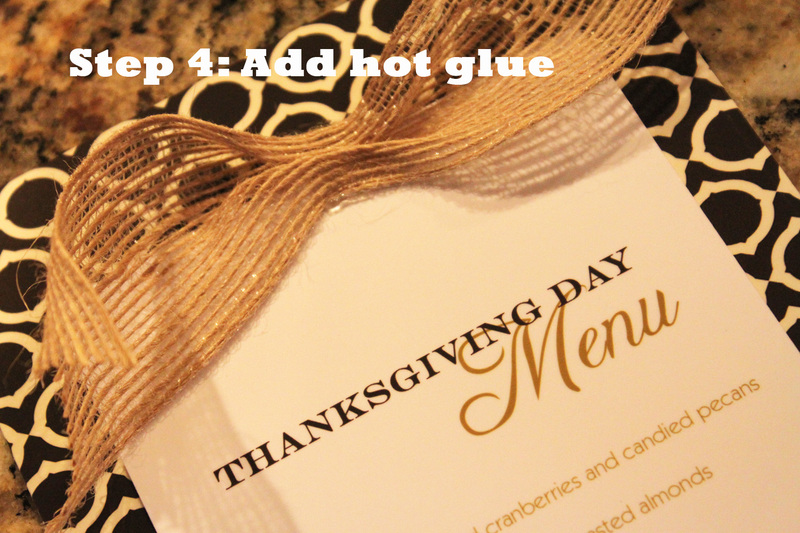 Step 4: Add a touch of hot glue to the back of your ribbon and secure it to the top of your menu. Step 5: Attach your 2" Thanksgiving logo to your ribbon and menu with a dot of hot glue. If you are placing your menu on your plates you can stop here. If you would like to have your menu standing in a placecard holder, you might also want to decorate the back of the menu. 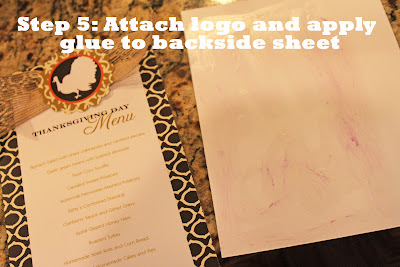 Use the other half of your background paper sheet left over from your first cut and apply a glue stick to the back of the paper. Step 6: Attach the front finished menu card to the decorative paper for the back of the card, lining up edges and press down firmly. Cut off any excess paper with scissors. Now your menu card is beautiful on the front and the back and ready for a standing display. Beautiful, don't you think? Menus and placecards add a warm, personalized touch to any celebration dinner and it's so easy to do, too. I hope that you enjoyed the tutorial and remember that the Thanksgiving Collection is on sale now at 40% OFF! I love all your clever decorating ideas! The turkey cupcakes are just TOO CUTE! My grandsons will have a blast making them(and they will think they have the coolest memaw)!!! 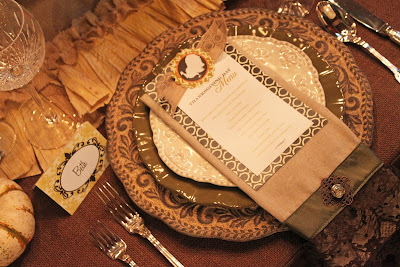 What a beautiful menu and table runner. Keep up the lovely work! Happy Thanksgiving! I hope you'll stop by and enter my giveaway.